Sensors | Penn State, North Carolina State University, the University of Virginia and Florida International University will collaborate on a national nanotechnology research effort to create self-powered devices to help people monitor their health and understand how the surrounding environment affects it, the National Science Foundation (NSF) announced today, September 5, 2012. Penn State, North Carolina State University, the University of Virginia and Florida International University will collaborate on a national nanotechnology research effort to create self-powered devices to help people monitor their health and understand how the surrounding environment affects it, the National Science Foundation (NSF) announced today, September 5, 2012. The NSF Nanosystems Engineering Research Center for Advanced Self-Powered Systems of Integrated Sensors and Technologies (ASSIST), to be headquartered on NC State’s Centennial Campus, also includes five affiliated universities and about 30 industry partners in its global research consortium. 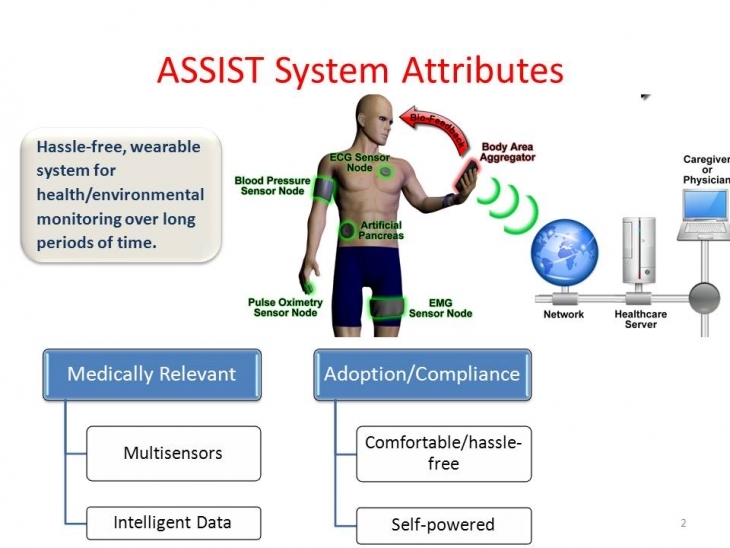 ASSIST will be funded by an initial five-year $18.5 million grant from the NSF. ASSIST researchers will use nanomaterials and nanostructures - a nanowire is thousands of times thinner than a human hair - to develop self-powered health monitoring sensors and devices that operate on small amounts of energy. ASSIST researchers will make devices from thermoelectric and piezoelectric materials that use body heat and motion, respectively, as power sources. "The ASSIST program offers an opportunity to utilize core Penn State strengths in materials, nanofabrication, low power circuits and biobehavioral health to advance human health. This is an extremely exciting opportunity for the researchers involved," said Susan Trolier-McKinstry, Penn State professor of materials science and engineering. "Currently there are many devices out there that monitor health in different ways," said Veena Misra, the center’s director and professor of electrical and computer engineering at NC State. "What’s unique about our technologies is the fact that they are powered by the human body, so they don’t require battery charging." These devices could transform health care by improving the way doctors, patients and researchers gather and interpret important health data. Armed with uninterrupted streams of heart rate readings, respiration rates and other health indicators, sick people could better manage chronic diseases, the elderly could be monitored from a distance and healthy people could make better decisions to keep themselves fit. For example, personalized exposure data for environmental pollutants such as ozone and carbon monoxide could help a child suffering from asthma avoid an environmental trigger for an attack. Miniaturized devices the size of a pen or wristwatch will make compliance simpler and therefore more likely, resulting in better health outcomes and reduced health costs to society. The center’s partner institutions will play important research roles. At Penn State, researchers will create new piezoelectric materials and devices; energy-efficient transistors; extremely low-power sensors; and help understand the correlations between environmental exposure and human health. The Penn State team includes faculty from the Colleges of Engineering, Earth and Mineral Sciences, Education, and Health and Human Development, with Tom Jackson, Penn State professor of electrical engineering, serving as the center’s research director.